Very nicely complement the landscape design of the suburban area construction of hydraulic. Most suitable natural waterway, but not all gardeners are lucky enough to have such an object in his garden. An alternative to a leaking pond can be an artificial pond or fountain in the country. The, another option is not hard to do with your hands. The only important caveat – the design of the pond. You must include all their imagination in order, that would be nice to decorate beach waterworks. You can use natural stones, plants and MAF. 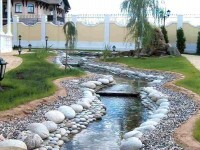 These galleries will show you the most interesting photos of the design of fountains and ponds in the suburban area! 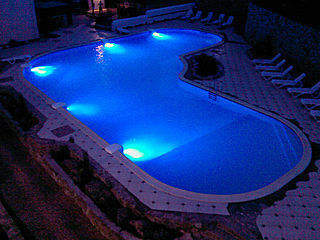 What fixtures are needed to illuminate the pool at night? All content on this site SamDizajner.ru written specifically for Simdesigner, copying 1 in 1 strictly prohibited. Reprint, full or partial rewriting of the article “A stream in the country”, possible, only when you specify the full, active link to the source.